Co-op games are far and few between in 2018, and of those that exist, few get the blend of engaging gameplay blended with a co-op system which works. Hacktag looks to rectify this issue in a way that is fresh and unique, whilst ensuring co-op is at the forefront of the games systems. I’m not going to lie, the best thing about working at Big Boss Battle is meeting new people and the games they have created, and there’s no better time to do that than while at events such as EGX Rezzed. The new pool of talent coming about in the indie games arena is astounding. It also helps when you have someone like Jodie Fortuin, from Indie Toaster, accompanying you, who is equally passionate about indie games. In addition, it was because of Jodie’s interview with such a developer that I managed to play Hacktag. She asked me to accompany her in playing this game, and I am very thankful I did. 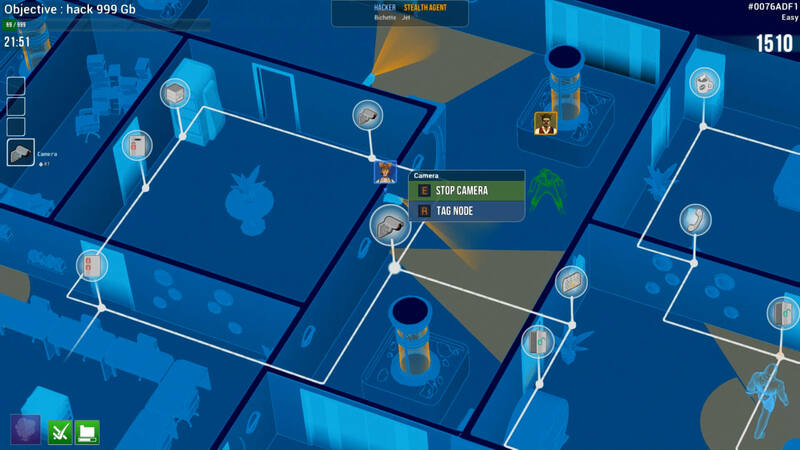 Hacktag’s Gameplay requires two players to work in harmony as stealth agent and hacker. Hacktag is a co-op stealth-game from an asymmetric viewpoint. You can choose to play as the stealth Agent on site or as the virtually infiltrated Hacker. Working together, you carry out espionage missions where nothing goes as expected! This premise intrigued me and after an introduction to the enthusiastic developer, Bérenger Dupré, co-founder at Piece of Cake Studios. After our chat with we both jumped into the game in co-op mode to see how it played. Quick spoiler… it was a lot of fun. The game is currently out on PC through steam, and we are hoping the process for getting this on Console to be smooth sailing. After our chat with we both jumped into the game in co-op mode to see how it played. Quick spoiler…it was a lot of fun. The game is set in a parallel universe, one which is inhabited by anthropomorphic animals. You take control of a duo who take on secret missions for large corporations — big risk for big rewards. To succeed in your missions you and your partner must simultaneously infiltrate the target rival corporation, but both by very different means. One takes a stealth, physical entry, sneaking past guards and taking data the old-fashioned way, whilst the second attacks the corporation electronically, hacking the systems and helping the first with locked areas. Hacktag’s controls are easy to use regardless of the character you control. Due to its ease of use you can easily understand the input you need as to progress forward. Both characters, be it the stealth agent or hacker, have their own unique input style and their mini games reflect this. Both Jodie and I played through the game using a controller, which felt really responsive. The analogue-stick movement was extremely well done — I never felt that any of the errors I made were down to the inputs. Now while the game supports a single player mode, which expects you to simultaneously handle the dual roles of the agent and the hacker, Hacktag’s biggest draw for me was the Co-op. Another great feature — and one I personally would like to see more of in other games — is the splitscreen when playing together, which swaps out to a main screen when playing online. This helps you understand what you, as a partner need to do for your friend, rather your mate shouting in your ear. Now, don’t be fooled into thinking that this is an easy game being co-op, as it isn’t. You will need your wits about you as to ensure that you get the best result. It took great teamwork to ensure we even made a B rating on the level we played, and I can see this being a great way to push the games ranking, leaderboards and even online challenges. Few co-op games in today’s market instill a need for communication. Here it is imperative otherwise you will end up a frustrated mess. This specifically come into play when engaging in the many co-op mini-games: You will need to deactivate alarms, and unlock doors or holding cells; set phones off and brew coffee as to keep guards at bay etc. This aspect is fun, and just cements your need to communicate and, for me at least, makes the game reminiscent of the co-op we loved, and the co-op many of us have been waiting for the return of. The game also features a simple perk system, which is unlocked using experience gained from the jobs in question. These allow you to choose new active or passive skills as progress in the game. It is a nice touch which adds a bit more variety to the already engaging gameplay. You can play through Hacktag’s story with the supplied, vanilla characters, or, interestingly, you can experience Hacktag’s story with your very own custom characters. We didn’t actually get into the bones of this, but it’s definitely something I am very much looking forward to seeing more of. Currently the game features three corporations and three types of missions playable within 24 levels. Each of these levels are built to be around 30 minutes long, however this all depends on the skill and synergy of the players. The design of the levels allows for a fun, sometimes-stressful, experience. The design of the level we played was varied, with the interlaced office spaces allowing for an interesting network of pathways for you to navigate regardless of the character you choose. For me, the variety in the stage design really show cased off both the fun nature of the game and the need to not only to keep an eye on your own screen, but also be aware of what your partner is doing. Hacktag has a minimalist style of sounds and music to ensure it doesn’t become too distracting from the gameplay. Instead the developer have included a variety of beeps and blips which acknowledge what you and your partner are doing. Hacktag’s visual style, with its slightly cartoon, bright style, is a joy to behold; The lovely character models, movement and smooth animation really sells the game. There is also the previously mentioned full character creation system, which allows you to customize your anthropomorphic animal character with over 350 unlockable items. This is a joy to play and one I’d recommend with a friend, for a true representation of how the game should be played. You will spend hours chatting to your mate, discussion strategies, moaning at each other and generally have a great time. If I can leave you with one thing regarding this game, it is that it will make you want to play more co-op games. That, in itself, is a fantastic achievement for any game to achieve, let alone it coming from an indie developer with limited funds / time. This really should tell you all you need to know and I would recommend you keep an eye out for this one, as I know I will be doing so. Hacktag is currently available on PC and Mac through Steam, and we are hoping the process for getting it onto consoles to be smooth sailing, with a release soon.